So you might wonder: Why do I need to make a backup of my Ceph monitors? I have multiple monitors. That’s true, but would you run into the very unfortunate situation where you loose all you monitors, you loose all your data. The monitors contain very important metadata (pgmap, osdmap, crushmap) to run your cluster. If you loose that metadata, you practially loose all your data. drwxr-xr-x 3 root root 4096 Sep 23  2013 .
drwxr-xr-x 3 root root 4096 Mar 24 11:04 ..
drwxr-xr-x 2 root root    4096 Mar 25 14:09 .
drwxr-xr-x 3 root root    4096 Sep 23  2013 .. So it’s very tempting to simply run your favorite backup tool and back up this directory. Usually it’s less then 500MB, so it’s very simple to do so. It’s however not a wise idea to do so, since you have to be sure the LevelDB database is in a consistent state before backing it up. In a production cluster you will probably have a least three monitors, so stopping a monitor is not a big problem. Put that in a Shell script and have CRON run it every 24 hours. Make sure not all three monitors create their backup at the same time, but this works just fine. You now have a tarball which you can upload to any offsite location to make sure your monitors are safe. Another solution would be to run the monitors on a ZFS on Linux filesystem and use ZFS’s snapshot functionalities. But you can’t be 100% sure that your LevelDB database is in a consistent state at that point. The safest solution at this moment is to fully stop the monitor, create the backup and start the monitor again. Just make sure you don’t stop all monitors at the same time. As of Ceph version 0.67 (Dumpling) the Ceph Object Gateway aka RADOS Gateway supports regions. This allows you to create a geo-replicated Amazon S3 compatible service. While working on a setup we decided later in the process that we wanted regions, but we already created about 50 buckets with data in them. We didn’t feel like re-creating all the buckets, so we wanted to change the region of the buckets. A fresh Object Gateway has a region ‘default’ with one zone ‘default’. We created the region ‘ams02’ (Amsterdam) with one zone called ‘zone01’. All buckets had the region ‘default’ which we wanted to change to ‘ams02’. No data migrated is required since all the data is on the same Ceph cluster. This can be done with a couple of ‘radosgw-admin’ commands. The bucket in these examples is ‘widodh’. The id at the end is ‘bucket_id’ from the previous command. Save this output to a file and change the ‘region’ value to what you want, in this case I changed ‘default’ to ‘ams02’. ceph_rgw_region = "NEW RGW REGION"
Use this script with caution since it will change the region of ALL buckets on your cluster to what you specify. About 1 hour ago the new storage subsystem got merged into the master branch of CloudStack. That is wonderful news for all you out there who want to use features like snapshotting with RBD in CloudStack. In pre-4.2 CloudStack a snapshot was the same as a backup. As soon as you created a snapshot it would also copy that snapshot to the secondary storage. This could not only lead to high network utilization when talking about 1TB RBD volumes, but it also caused problems with the underlying ‘qemu-img’ tool. To make a long story short: Snapshots with RBD just wouldn’t work in CloudStack 4.0 or 4.1 without resorting to dirty hacking. Which we didn’t. The new storage subsystem separates the backup and snapshot process. Snapshots are handled by the primary storage and they can be copied to the ‘backup storage’ on request. This allows is to use the full snapshot potential of RBD. I was waiting for the storage subsystem to be merged into the master branch before I could start working on this. About two weeks ago I already wrote a small function spec in CloudStack’s wiki to describe what has to be done. A couple of choices still have to be made. Traditionally we could do everything through libvirt and ‘qemu-img’, but from what I can see now we’ll run into some trouble. We might have to go through the process of wrapping librbd into a Java library to get it all done, but I’m not completely positive about that. Some patches for libvirt(-java) could probably also do the job, but it would take a lot of time and work to get those upstream and into the repositories. The goal is to have this new RBD code work natively on a Ubuntu 13.04 system. The expectation is that CloudStack 4.2 will be released mid-July this year, but if you are a daredevil you can always track the master branch and play around with that. I’ll post updates on the cloudstack-dev list on a regular base about the progress, but you can also watch the master branch and search for commits with ‘RBD’ in the message. In the beginning of this year we (my company) decided we wanted to use CloudStack for our cloud product, but we also wanted to use Ceph for the storage. CloudStack lacked the support for Ceph, so I decided I’d implement that. Fast forward 4 months, a long flight to California, becoming a committer and PPMC member of CloudStack, various patches for libvirt(-java) and here we are, 25 September 2012! RBD, the RADOS Block Device from Ceph enables you to stripe disks for (virtual) machines across your Ceph cluster. This not only gives high performance, it gives you virtually unlimited scalability (without downtime!) and redundancy. Something your NetApp, EMC or EqualLogic SAN can’t give you. Although I’m a very big fan of Nexenta (use it a lot) it also has it’s limitations. A SAS environment won’t keep scaling for ever and SAS is expensive! Yes, ZFS is truly awesome, but you can’t compare it to the distributed powers Ceph has. If you are happy with that you’ll able to allocate hundreds of TB’s to your CloudStack cluster like it was nothing. What do you need to use RBD for Primary Storage? If that works you can go ahead and add the RBD Primary Storage pool to your CloudStack cluster. It should be there when adding a new storage pool. About the snapshots, this will be implemented in a later version, probably 4.2. It mainly has to do with the way how CloudStack currently handles snapshots. A major overhaul of the storage code is planned and as part of that I’ll implement snapshotting. Testing is needed! So if you have the time, please test and report back! You can find me on the Ceph and CloudStack IRC channels and mailinglists, feel free to contact me. Remember that I’m in GMT +2 (Netherlands). Distributed storage under Linux, is it there yet? When it comes down to storage under Linux you have a lot of great options if you are looking for local storage, but what if you have so much data that local storage is not really an option? And what if you need multiple servers accessing the data? You’ll probably take NFS or iSCSI with a clustered filesystem like GFS or OCFS2. When using NFS or iSCSI it will come down to one, two or maybe three servers storing your data, where one will have a primary role for 99.99% of the time. That is still a Single Point-of-Failure (SPoF). Although this worked (and still is) fine, we are running into limitations. We want to store more and more data, we want to expand without downtime and we want expansion to go smoothly. Doing all that under Linux now is a ……. Let’s say: Challenge. Energy costs are also rising, if you like it or not, it does influence the work of a system administrator. We were used to having a Active/Passive setup, but that doubles your energy consumption! In large environments that could mean a lot of money. Do we still want that? I don’t think so. Distributed storage is what we need, no central brain, no passive nodes, but a fully distributed and fault tolerant filesystem where every node is active and it has to scale easily without any disruption in service. I think it’s nearly there and they call it Ceph! Ceph is a distributed file system build on top of RADOS, a scalable and distributed object store. This object store simply stores objects in pools (which some people might refer to as “buckets”). It’s this distributed object store which is the basis of the Ceph filesystem. RADOS works with Object Store Daemons (OSD). These OSDs are a daemon which have a data directory (btrfs) where they store their objects and some basic information about the cluster. Typically a data directory of a OSD is a one hard disk formatted with btrfs. Every pool has a replication size property, this tells RADOS how many copies of an object you want to store. If you choose 3 every object you store on that pool will be stored on three different OSDs. This provides data safety and availability, loosing one (or more) OSDs will not lead to data loss nor unavailability. Data placement in RADOS is done by CRUSH. With CRUSH you can strategically place your objects (and it’s replica’s) in different rooms, racks, rows and servers. One might want to place the second replica on a separate power feed then the primary replica. This is a small RADOS cluster, three machines with 4 disks each and one OSD per disk. 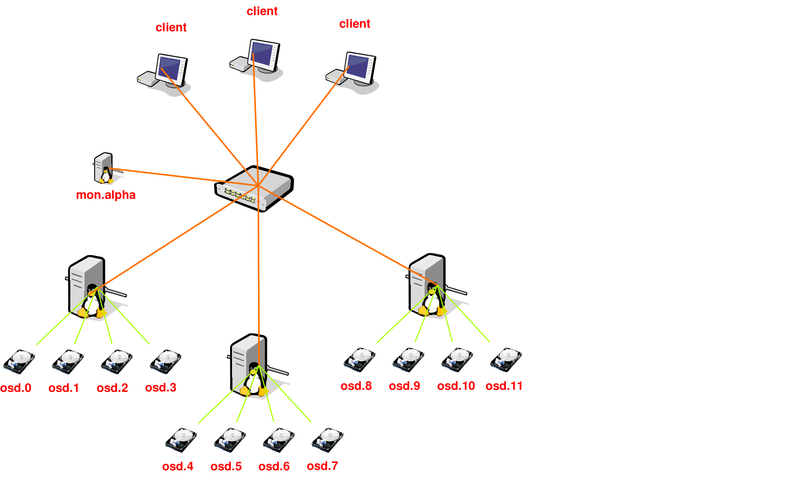 The monitor is there to inform the clients about the cluster state. Although this setup has one monitor, these can be made redundant by simple adding more (odd number is preferable). With this post I don’t want to tell you everything about RADOS and the internal working, all this information is available on the Ceph website. What I do want to tell you is how my experiences are with Ceph at this point and where it’s heading. I started testing Ceph about 1.5 years ago, I stumbled on it when reading the changelog of 2.6.34, that was the first kernel where the Ceph kernel client was included. I’m always on a quest to find a better solution for our storage, right now we are using Linux boxes with NFS, but that is really starting to hurt in many ways. Where did Ceph get in the past 18 months? Far! I started testing when version 0.18 just got out, right now we are at 0.31! I started testing the various components of Ceph, started on a small number of virtual machines, but currently I have two clusters running, a “semi-production” where I’m running various virtual machines with RBD and Qemu-KVM. My second cluster is a 74TB cluster with 10 machines, each having 4 2TB disks. As you can see, I’m running my cluster over IPv6. Ceph does not support dual-stack, you will have to choose between IPv4 or IPv6, where I prefer the last one. But you are probably wondering how stable or production ready it is? That question is hard to answer. My small cluster where I run the KVM Virtual Machines (through Qem-KVM with RBD) has only 6 OSDs and a capacity of 600GB. It has been running for about 4 months now without any issues, but I have to be honest, I didn’t stress it either. I didn’t kill any machines nor did hardware fail. It should be able to handle those crashes, but I haven’t stressed that cluster. The story is different with my big cluster. In total it’s 15 machines, 10 machines hosting a total of 40 OSDs, the rest are monitors, meta data servers and clients. It started running about 3 months ago and since I’ve seen numerous crashes. I also chose to use the WD Green 2TB disks in my cluster, that was not the best decision. Right now I have a 12% failure rate of these disks. While the failure of those disks is not a good thing, it is a good test for Ceph! Some disk failures caused some serious problems causing the cluster to start bouncing around and never recovering from that.. But, about 2 days ago I noticed two other disks failing and the cluster fully recovered from it while a rsync was writing data to it. So, it seems to be improving! During my further testing I have stumbled upon a lot of things. My cluster is build with Atom CPU’s, but those seem to be a bit underpowered for the work. Recovery is heavy for OSDs, so whenever something goes wrong in the cluster I see the CPU’s starting to spike towards the 100%. This is something that is being addressed. Data placement goes in Placement Group’s, aka PGs. The more data or OSDs you add to the cluster, the more PGs you’ll get. The more PGs you have, the more memory your OSDs start to consume. My OSDs have 4GB (Atom limitation) each. Recovery is not only CPU hungry, but it will also eat your memory. Although the use of tcmalloc reduced the memory usage, OSDs sometimes use a lot of memory. To come to some sort of a conclusion. Are we there yet? Short answer: No. Long answer: No again, but we will get there. Although Ceph still has a long way to go, it’s on the right path. I think that Ceph will become the distributed storage solution under Linux, but it will take some time. Patience is the key here! The last thing I wanted to address is the fact that testing is needed! Bugs don’t reveal themselves you have to hunt them down. If you have spare hardware and time, do test and report!